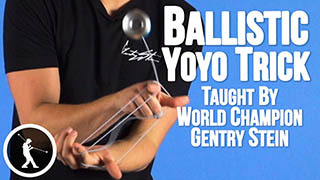 Add a comment to this video on YouTube.Learn to do World Champion Gentry Stein’s Space Jam yoyo trick, which involves a horizontal transition to a UFO, fingerspin, recapture, and finishes with a dynamic bind. To start you are going to throw a whip to Kamikaze. Then you are going to pop the yoyo to the back of the string into a Gyroscopic Flop. YoTricks already has tutorials up for both of these if you want to go check them out. 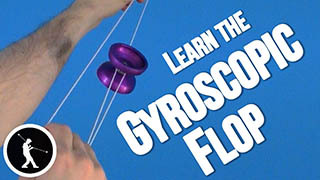 Next you are going to pop the yoyo straight up behind the top string into a UFO over your opposite arm. There is a lot going on in this part of the trick. 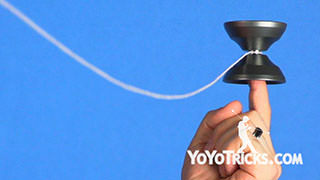 So the first thing you want to be thinking about is when you pop the yoyo up into the air. 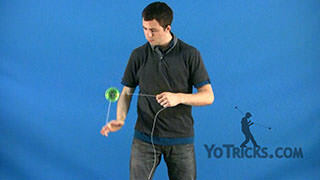 Your yoyo hand is going to move around the front and under the yoyo. This will move the wrap around the bearing. At the same time, you want your opposite hand to pass the front of the yoyo and your yoyo hand, leaving you in the position that looks like you are holding a tray at a restaurant. Before starting the motion, with your opposite hand remove all your fingers except for the index. While performing the motion, make sure you hook the string with your finger so it does not fall off. When you are first practicing this trick, you may find that the string gets twisted doing the UFO, so there are a few things you can do to try to avoid that. First, make sure you pop the yoyo straight up into the air and move your opposite arm underneath, instead of trying to pop the yoyo out this side and over your arm. If you are still having trouble with it at this point, you can try to exaggerate the movement with your opposite arm and push it out even further than before. Once you have successfully gotten into the UFO, then you are going to pop the yoyo over your opposite arm and catch it into a fingerspin. You will notice that the string is still on my opposite hand, and this will set us up for the next part of the trick. 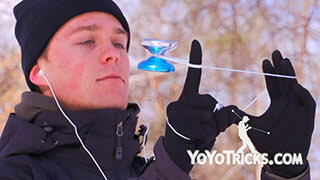 To make landing the fingerspin easier, you want to catch the yoyo with a little give. 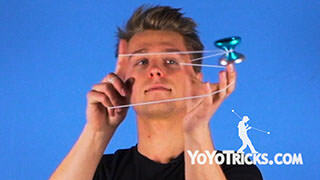 What I mean by that is you want to follow the motion of the yoyo downward as it lands on your finger. You also want to make sure that you do not pop the yoyo too high or too far. Next, you are going to pop the yoyo up into a recapture, spin it all the way around into a bind. 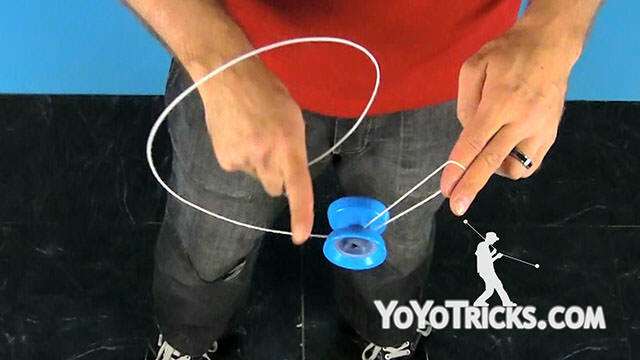 Immediately after popping it out of the fingerspin, you want to point your yoyo hand downward, push your index finger into the string, forcing the yoyo into the mount. To set yourself up for the recapture, you want to start by grabbing the string coming off your yoyo finger with your pinky and your ring finger. I usually like to do this while transitioning between the UFO and the fingerspin, as you can see. In order to land the recapture, the yoyo string has to be perfectly lined up with the gap of the yoyo. In order to do this, you want to make sure your hands are straight. To make this happen, you want to bend over a little bit, put your opposite hand under your elbow. Of course, it is a lot more difficult when the yoyo is spinning. Once you land the recapture, let go of the string with your opposite hand, swing the yoyo around while following the motion with your body. When you are ready to bind, swing the yoyo above your arm once and let go to bind. Two tips for this part of the trick: You want to make sure to hook the string with your fingers so it does not fall off. And as you are swinging the yoyo above your arm, you may find that you are hitting yourself in the eye, nose, or teeth. To avoid this just lift your hand a little bit higher. And that is Space Jam.